James Coleman Handsigned & Numbered Limited Edition Canvas:"Picking Flowers"
Image size: 30 " x 40 "
About the Artist : James Coleman - a name synonymous with sweeping skies, tropical rain forests, rich deep woods and silent deserts. The images created by this talented man continue to delight all that view them. Encouraged him to go into animation background painting. Walt Disney Productions welcomed his creative energies. 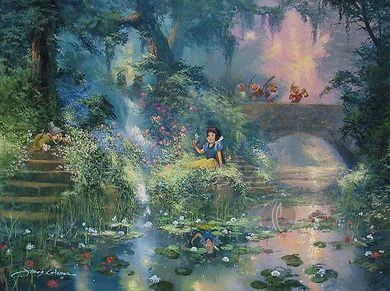 His first film," Winnie, the Pooh and Tigger, too," sparked his interest not only in painting backgrounds but also in background design and color styling.